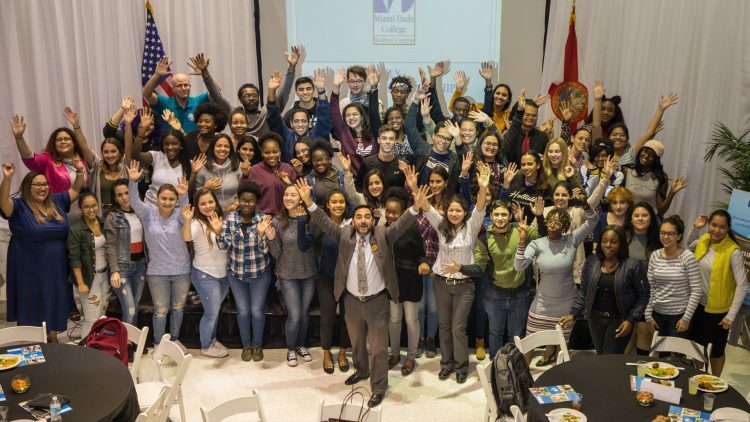 The Braman Family Foundation has renewed its commitment with an additional $500,000 to support another 500 students to complete their studies at Miami Dade College (MDC) and Florida International University (FIU) during the 2018-2019 academic year. In 2017, the Braman Family Foundation donated $1 million toward scholarships as an incentive for students to enroll full-time during their last year and accelerate completion. The Braman Scholarship awarded $1,000 to 500 MDC students and 500 FIU students. This fall, another 500 students in their final year of studies will be selected to receive scholarship funds. In its first year, the Braman Scholarship was integral – helping the majority of these scholarship students graduate either this spring, summer or fall semester. MDC’s wraparound services also played an integral role in providing the inaugural scholarship students with extra support to help them reach their educational goals. College advisors provided them with information and guidance related to their graduation requirements, course information, milestones and the transfer process.